Do you really believe that a goldfish has a longer attention span than you do? If so, then why can you buy a cheap replacement in a plastic bag full of water after you flush the dead one down the toilet? Living in Manhattan, I battle screen-engaged people of all sizes, backgrounds and ages whenever I venture out of my apartment. Without seeming to pay attention to what’s in front of them, they gesture wildly while screaming at invisible listeners. Despite this, they’ve retained their innate ability to focus on what’s most important, namely staying alive. Whether it’s warm dog poop on the sidewalk or on-coming traffic at a major intersection, they avoid harm and survive without loosing a beat. 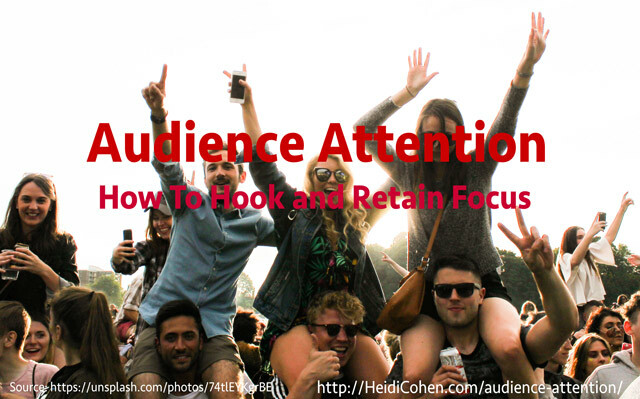 Audience attention still exists but it’s more complicated. For your content marketing and social media to succeed, you must understand how human attention has evolved. Then adapt your marketing to attract audience attention and retain it long enough to deliver your message. 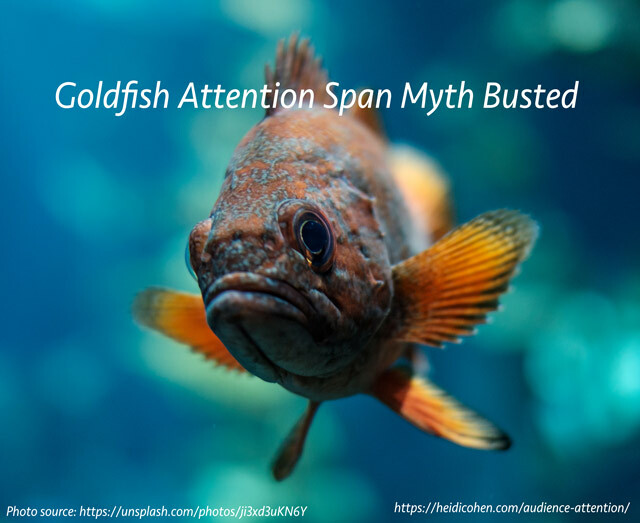 Ironically, the goldfish attention span myth gained traction via media entities like The New York Times and Time Magazine who employ fact checkers. But there they failed. The BBC investigated the sources including Statistic Brain, the US National Library of Medicine, and the Associated Press, but they found that the information was vague with no research to back it up. Further, according to Professor Felicity Huntingford, goldfish are the species that neuropsychologists and scientists use to study memory formation because they have a memory and they learn. In fact, there are hundreds of scientific papers on fish memory dating back to 1908. In terms of human attention and memory, according to Dr. Gemma Briggs of The Open University, people’s expectations and experience in specific situations molds how they process information at a given time. To succeed, marketers need to understand how attention has evolved and how to adapt our marketing to attract and retain our audience’s attention over time. To deliver your content marketing and social media and get it read, you must hook and retain your target audience’s attention. As a result, your audience allocates mental resources to notice visual or conceptual objects. Therefore let’s examine the 3 types of audience attention based on Microsoft Research. 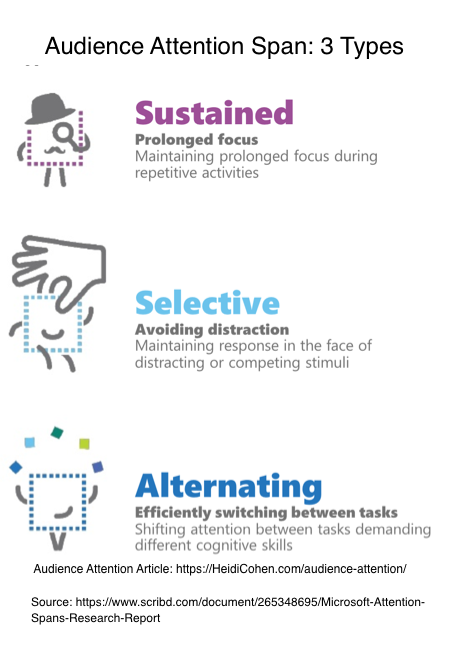 Sustained attention allows individuals to maintain focus despite distracting and/or competing stimuli. Yet your ability to focus for extended periods is hampered by the increased information input from social media delivered through multiple devices. As a result, you experience information overload. Despite this challenge, your marketing messages can still break through! Our brains have evolved to handle this challenge. They process and encode information more efficiently with higher attention bursts. Therefore your content must be crafted to capture sustained audience attention long enough to convey your message. Make your marketing messages clear, personal and relevant. This applies to content marketing and social media. Where possible, select smaller audience segments to provide more tailored communications. Get to the point quickly. Convey as much information as fast as possible or they’re on to the next item. Use headlines and images to deliver complex information that’s easy-to-process. Selective attention allows people to filter out non-device and media distractions. While selective audience attention reduces focus during multi-screening activity, there’s a marketing opportunity! Use these selective attention interruptions to attract new readers. Keep information simple. Don’t make readers think! Allow readers to easily move from point to point. Remove competing stimuli from your information. Avoid distractions to keep audience focus. Hijack new audience attention when they’re distracted. To grab reader attention, stand out in other contexts. Ideally defy your prospect’s expectations. Alternating Attention allocates mental resources between different cognitive activities. Due to social media and related technology we’ve developed skills to process and encode information with short bursts of attention. To maximize information consumption, digitally savvy users front-load their attention with more bursts of high attention. As a result, they sift through information quickly to identify what’s most interesting to them. BUT: Alternating attention only works for a limited period of time before reaching information overload! Capture audience attention from people in this alternating attention mode by fulfilling their need for a new thrill. Go ahead and give them the dopamine boost they really want! Use this approach to stand out in their social media feeds. Further tap into the power of second screening. multi-screeners are an appealing target. Since multi-screeners are primed for more immersive experiences, they’re more likely to act. Specifically appeal to users who use another device to fill moments when they might otherwise drop off completely. Used this way, multi-screening can provide higher overall engagement. Increase emotional connection to content. Aid readers’ ability to encode information to memory. Hook readers right away. Craft headlines that tell it all with clear and concise language. Keep your audience engaged. Use storytelling techniques to keep them hooked and wanting more. Add cliffhangers across pages, screens and/or sequential messaging. Put calls-to-action in your content. Make them stand out. Develop immersive and multi-touchpoint experiences. Reduce audience’s drop-off by using multiple screens. To increase your content marketing and social media’s chance of attracting readers and getting them to consume and act on your information, use these 7 attention triggers. The success of these triggers lies in their ability to appeal to the brain. Put routine activities on autopilot, they don’t occupy your mind. It requires learning, repetition, and practice. Use specific sensory cues like colors, symbols, or sounds to get attention. Create cyclical content to become part of your audience’s regular content consumption. Create a cognitive bias based on how information is presented. This allows you to change how your audience reacts to a choice. Adapt or change audience perspective in a given context so they pay attention to your content. Present your audience with the unexpected to interrupt attention. What you use depends on the context. Break audience expectations with interrupting information or an idea they aren’t expecting. Provide an incentive for taking an action that increases the chances that your reader does something that you want him to do. This is also known as reinforcement. Appeal to your audience’s desire for a prize or acknowledgement. People seek to improve their status in a group. It motivates people to act in a certain way. From a marketing perspective this helps improve trustworthiness. Use influencers to instill trust and capture attention. Create suspense to hook your audience’s attention and keep them wanting to know more. This dates back to Charles Dickens who included a cliffhanger in each chapter of his serialized novels. Insert cliffhangers into your content to keep readers engaged. Add them to keep people reading one article, across platforms or for different episodes. Recognize your audience members when they take actions you want them to take. The sooner you do this, the more you increase the likelihood that they’ll do it again in the future. Use this trigger to shape or change behavior. Foster relationships and deeper connections to encourage people to pay attention. Despite signs to the contrary, audience attention spans have NOT decreased. Rather they’ve adapted to current information needs and delivery. Further, let’s debunk the Goldfish Attention Span Myth once and for all. Not only is it fake, but also it’s not true. Scientists have used fish as a model for human attention and memory for years. In terms of your marketing, improve the ability your content marketing and social media to attract attention and keep focus until people act by understanding the 3 new forms of audience attention. Then craft your messages to attract and keep reader attention and focus. Tags Audience Attention, Goldfish Attention Myth, Microsoft, Research. Bookmark the permalink.